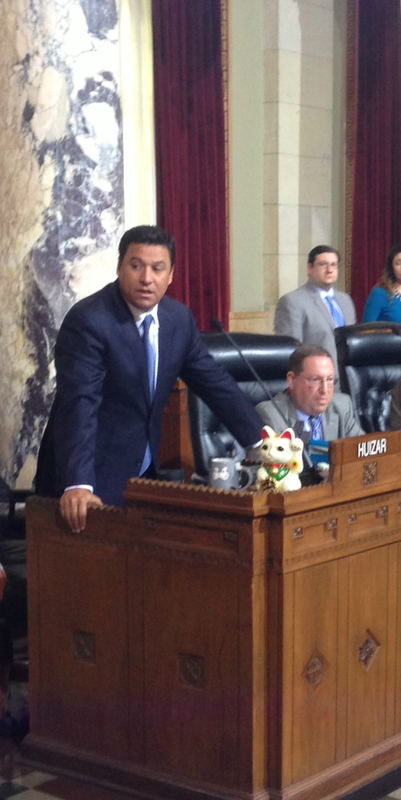 City Council Planning Committee Chair Jose Huizar speaking in favor of Mobility Plan approval today. Photo: Joe Linton/Streetsblog L.A.
After a lengthy and contentious debate, the full Los Angeles City Council approved the city’s new Mobility Plan, the Transportation Element of the city’s General Plan. Mobility Plan 2035 replaces the city’s former transportation plan in effect since 1999. 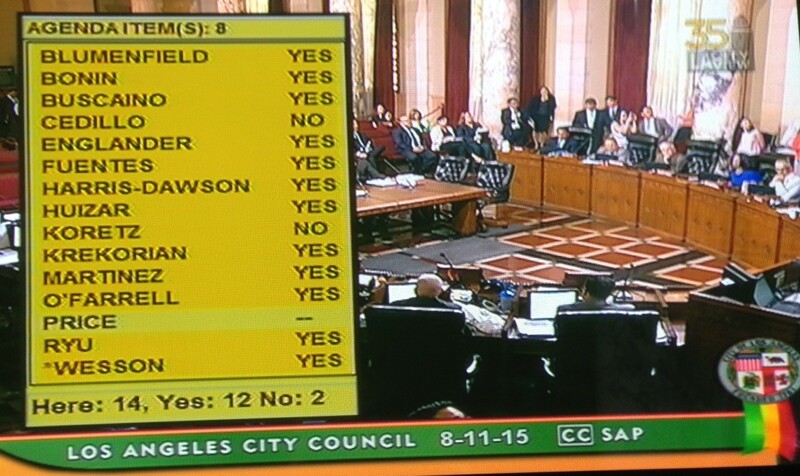 The final vote was 12 in favor, with only Councilmembers Paul Koretz and Gil Cedillo opposing. Public testimony was limited to 20 minutes, and was heavily in favor of plan approval. Councilmember Koretz continued to press til the last moment to remove Westwood Boulevard from the bikeway network. Ultimately, he forced a vote, which lost with only three councilmembers in support. Councilmember Gil Cedillo continued to press for pretty much all future Council District 1 bikeways to be removed from the plan, as his staff had proposed in committee last week. When Cedillo questioned Department of City Planning staff about these modifications, they responded that a change of that magnitude was likely to trigger additional environmental studies. Councilmember David Ryu proposed removing 4th Street from the bikeway network. Other than the Koretz motion, which was voted down, the rest of the proposed amendments will be heard later, in a joint meeting of the Planning and Transportation committees anticipated in September. Councilmembers Jose Huizar and Mike Bonin showed strong livability leadership in ensuring committee and council approval, and staving off piecemeal amendments. Ultimately, Huizar and Bonin were able to shepherd plan approval with only two council amendments. In committee, Councilmember Marqueece Harris-Dawson added that the plan would include equity in implementation. Today, Councilmember Ryu added that plan implementation would consider public safety and community input in implementation. Ultimately, it is just a plan. The 1999 plan had similar language about “transit priority streets” and “safe and convenient bicycling” that has, for the most part, failed to materialize. Communities will need to organize and press to translate the Mobility Plan’s multimodal vision into improved safety and broader mobility choices in L.A. neighborhoods. It is the Affordable Housing which is scarce in Los Angeles and the reason for that is known. They tore down affordable homes in order to build luxury condos for the wealthy Millennials. The Figueroa bike lane would also slow down buses, so a shared transit/bike lane might do better. On Seventh Street Downtown, bus travel has gotten much slower west of Los Angeles Street, where it becomes one lane in each direction. Ironically it would be faster to get off the bus in the Fashion District and ride downtown, but the first phase of bikeshare does not include that area. The biggest problem here is that the LA police seem to be a crime (extortion/threats/self-dealing) ring, rather than a police force. So of course they don’t give a damn about people braking the law in ways which endanger people. This makes it very hard to enforce any laws, with the “police” unwilling to enforce any laws (but happy to harass and murder people for their own sick jollies). I am so happy that Agenda 21 finally made it into the discussion. SAFE STREETS ARE A GLOBALIST CONSPIRACY. Unlike the actual conspiracy that ripped out the street cars and ran freeways through our cities. You know what regularly slows down buses more than road diets or bikes? Cars! Four 11-foot lanes on Westwood might be OK, which would leave two 7-foot bike lanes but no parking. City buses with their mirrors are 10 feet wide, and heavy trucks with their mirrors are 9.5 feet wide. There are some cities which allow street parking outside of rush hour when the parking lane becomes a travel lane. Cleveland does that on quite a few of its city arteries, and Cleveland generally uses 10-foot lanes but on any street where you may have trucks passing stopped buses I really can’t see less than 11-foot lanes. You link to the “various studies” showed that there is a difference of belief between the National Highway Capacity Manual and the Florida Department of Transportation. The same piece also noted that narrower lanes seem to work in some States and don’t work as well in others. My own belief as a 30-year freight transportation professional is that most of the States where narrow lanes work better are States that already have narrow lanes as well as restrictions on heavy truck movement, such as States in the northeastern US. Lane widths as little as 11-feet are common even on freeways there. State oversize transport laws dictate lane width and this issue varies widely among States. Any designated truck route or even primary artery under the Federal FAST Act must have minimum lane widths and minimum clear zones too. If Westwood is a primary artery under the FAST Act it will be difficult to markedly change it. Now if Westwood is a commercial street I’m sure that there is plenty of truck traffic as well as bus traffic. With lanes of only 10-feet you will have trucks and buses hitting mirrors, as well as the chance that a pedestrian or a bicyclist could get hit by a mirror too, even standing on the curb. If you only have 48 feet curb-to-curb I could see four 11-foot lanes, a 1-foot buffer on each side, and then 6-foot bike lanes but I realize that will make it difficult for a faster rider to pass a slower rider. During non-rush periods street parking could be allowed but the city would have to be quick with tow trucks to move vehicles from the parking lane once 4-lane operation started. It is an idea involving some trade-offs, as it would be less-safe for bikes during rush hour to only have a 1-foot buffer lane than being protected by a row of parked cars. Still it would move more traffic, especially if left turns are also eliminated to minor streets also. Now you bicyclists remember that buses and heavy trucks turning right have very large blind spots and their drivers may not be able to see you in their vehicle’s mirrors. I also question putting bike lanes on major arteries as bike riders on major arteries are exposed to several times the amount of unhealthy particulate pollution as vehicle occupants according to a recent study of this subject done by Colorado State University. As bike riders are exerting and drivers and riders are sedentary, and vehicle cabins have air filtration, bike riders on major urban arteries are exposed to brake dust particulates, pavement dust, and oil & grease particulates in-addition to vehicular exhaust. I hope that this subject doesn’t turn out to be an issue like smoking cigarettes leading over many years to lung cancer, COPD, and emphysema is. This is a similar 2016 study from Toronto, Ontario, Canada: “Keep riding that bike – but protect your health by choosing routes with less diesel exhaust & other traffic related air pollution”.